Gina Piazza is the CEO and founder of GMP Fitness®, an endeavor started more than twenty-five years ago with a mission to promote health and fitness. Today, Gina is an educational leader in the sports, health and fitness industry. Over the years she has witnessed a major shift in the value perception of a healthy lifestyle. A featured columnist and advisor to over twenty health and fitness, personal trainer, chiropractic and related trade publications; she is an advocate of the fitness and wellness message and pioneer in development of educational programs and products. A University of Massachusetts Exercise Science graduate, she managed and supervised the student weight training facility and the faculty fitness center. Her earlier employment history includes EKG Specialist at Children’s Hospital in Boston, Head Training Specialist at both a chiropractic practice and physical therapy clinic and owner of a performance training consulting company catering to Fortune 100 executives, teen athletes, young children, and special needs population. As an author and producer of over thirty books, videos, learning tutorials and innovative educational products, Gina has led her company to prominence in the sports and fitness industry. Gina’s first book, Fit To Break Par catapulted her to recognition as a golf fitness expert. An appearance on the Golf Channel led to other broadcast media interviews and features in Golf for Women, Golf Digest, Senior Golfer, PGA and Golf magazine. A companion video launched afterwards. After appearances on Fox News with Golf Magazine, Fit To Break Par received a superb rating from Golf Magazine, and was nominated “just right for giving” by American Health Magazine. Educating golfers on her programs at the prestigious Baltusrol Country Club expanded to demonstrations at the PGA Show and a variety of golf fitness seminars. A second golf video, 9 Hole Golf Fitness® followed Fit to Break Par and both were awarded the Seal of Approval from the PGA Partners Club. A significant step in professional and consumer education development was achieved through GMP Fitnes® production of the G Ball Fitness Series of books and video programs. Notable were Stop the Slouch, Lower Back Care, Shoulder Care, Upper Back & Neck Care, Stretch It Out, and No Hips, Thighs Or Butts About It. As a recognized Continuing Education provider, Gina has created numerous training courses that have been endorsed by over fifteen Fitness Certifying Organizations and has helped energize thousands of professionals. To date there are twenty courses that instruct health, fitness and medical professionals. These courses include high quality educational materials in a variety of media kits to cultivate the credibility of training services. She has also written many articles for industry publications on how to broaden and sharpen these skills. As GMP Fitness® grew, partnerships with the chiropractic profession were initiated. Working within this discipline led to the development of educational courses and products tailored for doctors of chiropractic. The research in this arena helped to identify the need for a publication that could help guide chiropractors to form alliances with professional trainers. In this publication, Creating a Fitness & Wellness Profit Center, she guides chiropractors with detailed, step-by-step information and advice on how to help transform any practice into a fitness and wellness profit center that builds business while also helping patients. 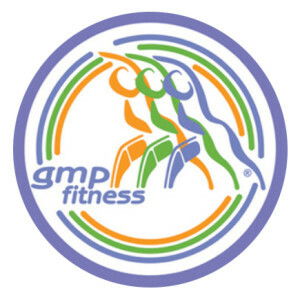 GMP Fitness® has a Promotion Division which offers a variety of high-quality products to build brand visibility. These unique business logo identified favorites are specifically created for corporations and medical professionals as prizes and giveaways at sponsored golf events or rewards programs, as well as company service appreciation gifts. GMP Fitness® is a Presidents Challenge Advocate and an official, organizational affiliate for the Stop Sport Injuries campaign. GMP Fitness® is also working with several initiatives that are doing concussion injury prevention including Parachute and many other concssion injury prevention companies.